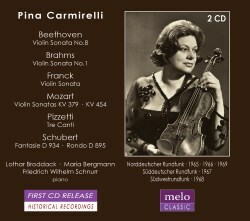 I'm sure that this release from the enterprising Meloclassic label will prove popular with violin aficionados, as it fleshes out the violinist's discography to a considerable extent. All five broadcast recordings, taped between 1966 and 1969, are here making their silver disc debut. Presently, availability of Carmirelli performances on CD is confined to her work with I Musici, in concertos by Albinoni, Pergolesi and Vivaldi. Aside from her chamber collaborations, scouring the internet I could only find her featured in a solo role on two occasions: the Beethoven Concerto and Bach’s Chaconne on obscure Sastrophon German LPs - which I would fervently urge some company to refurbish and reissue. She was born in 1914 in Varzi, Italy. Her grandfather was the conductor and composer Carlo Podesta, who provided the young Pina with some initial encouragement. She went on to study at the Milan Conservatory. In 1949 she founded the Quintetto Boccherini, a significant undertaking as she became something of an authority on Boccherini. She did much to research and promote the composer's music and had a hand in preparing editions of his oeuvre. Later she formed the Carmirelli Quartet and became first violinist in I Musici. She made her Carnegie Hall debut in New York in 1966 with Rudolf Serkin, with whom she formed a long association. From 1963 she performed annually in the chamber concerts at the Marlboro Music Festival. She taught for many years at the Accademia Nazionale di Santa Cecilia in Rome. She died in 1993 at the age of seventy-nine. There's much to enjoy in the diverse selection of music presented here. What are the highlights? There's a very fine performance of Brahms Sonata No. 1. Carmirelli and Lothar Broddack allow the music to unfold naturally, basking in its generous lyricism. The slow movement especially is deeply felt. The Schubert Fantasie is as good as any I've heard and, in the variation section on the theme Sei mir gegrüsst, Carmirelli characterizes each variation with delicacy and finesse. It's a pleasure to have the Schubert B minor Rondo, as it doesn't get that many outings. The players invest the closing section with verve and vigour - as invigorating a reading as you are ever likely to encounter. The geniality and Haydnesque humour of Beethoven's G major Sonata is always guaranteed to engender a sense of well-being, and this performance is no exception. The Pizzetti Tre Canti is a pleasing addition; a rarity I’ve never come across before. The entire contents of this admirable 2 CD set are in fine sound, and in each case the balance between the instrumentalists can’t be faulted. As is the norm, Meloclassic’s documentation is first rate, with English booklet notes scripted by Michael Waiblinger.